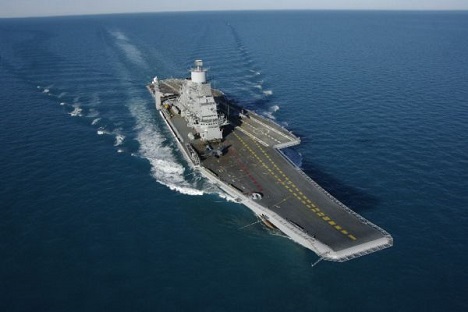 Vikramaditya marks a year of service in the Indian Navy. Source: Sevmash press service. It’s been over a year since the INS Vikramaditya was handed over to the Indian Navy. Recently, specialists from Rosoboronexport and Russian equipment suppliers inspected the flagship Indian aircraft carrier as a part of the warranty agreement. According to Sergey Marichev, Deputy Director General of the defense shipyard Sevmash, where the carrier has been substantially re-born, the Indian Navy has been using the ship intensively for the entire year. It spent more than 220 days at sea. “And that's more than the aircraft carrier spent in the Northern Seas on factory tests in two years,” the Severodvinsk shipyard said in a press note. Since the official transfer of Vikramaditya, several Indian leaders have the visited the ship, including Prime Minister Narendra Modi. In the presence of distinguished guests, and in a conventional setting, the MiG-26 K/KUBs have carried out 240 takeoffs and landings. As a result, the Indian pilots under the supervision of the MiG Corp completed the entire training program, including the preparation for independent night flights. During the whole time, the aircraft carrier had aboard a guarantee group of Sevmash specialists, who provided technical advice when needed and responded promptly to one or the other difficulty related to operating systems and mechanisms. The one-year warranty service expired on November 16th. But even before the expiration, the Indian side expressed the desire to extend the business relationship with the Russian shipyard and to agree on the service support for the aircraft carrier for its entire life cycle, which is at least 20 years. Russian shipbuilders and representatives of the Indian Defence Ministry are meeting in New Delhi this week to discuss the details of the carrier's after-sales service. And in late November, Vikramaditya will be put to sea again in order to continue flying aircraft in low visibility conditions. At sea, the Indian sailors and the airmen of the carrier-based aircraft will be accompanied by a Russian friend. Before the ship was sent to its current post of service, on one of its decks the craftsmen of Sevmash constructed a museum cabin, with exhibits that describe the design, the construction and the military service of the ship as part of the Soviet Navy, followed by the transformation of the cruiser into a modern aircraft carrier.